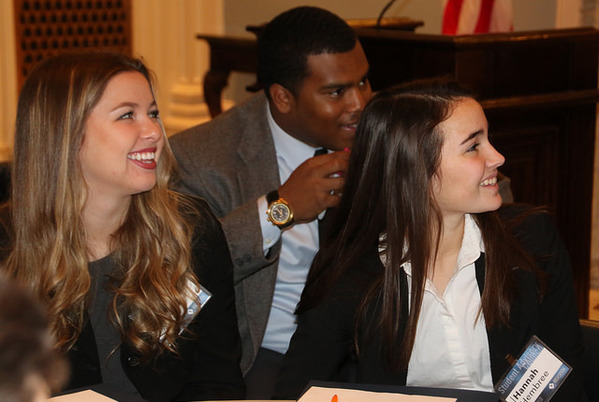 OKLAHOMA CITY (Jan. 19, 2017) – Many of Oklahoma’s student leaders met this morning with State Superintendent of Public Instruction Joy Hofmeister to discuss the state’s public education system and share their ideas about how to strengthen it. The gathering marked the first meeting of the 2017-2018 Superintendent’s Advisory Council, which consists of 99 high school students from across the state, 31 of whom are returning members who served on last year’s inaugural council. The group gathered in the Blue Room of the State Capitol to discuss three of OSDE’s top initiatives: redefining the senior year, defining a well-rounded education, and ensuring safe, supported and engaged school communities. Students participated in small-group discussions and provided feedback on all three topics. Members remarked on the value of the council and the unique opportunities it affords students to collaborate with their peers around the state. Hofmeister said today’s conversations were enlightening and productive. Members of the council were nominated by the superintendents of their districts. The group will meet again later this spring. For a complete list of students and their districts, click here. Click here for photos from the Student Advisory Council meeting available for media use.